Two popular classics combined to make a delicious and easy to prepare meal – sure to become the new favourite. Dice the onions and sauté in oil with the beef mince. Add KNORR Pronto Napoli and simmer for 30 minutes. Cook the macaroni in boiling water and strain. Allow the pasta to steam off on a large tray. Bring milk to the boil and thicken with KNORR Roux, add 250g of cheese and cooked macaroni. 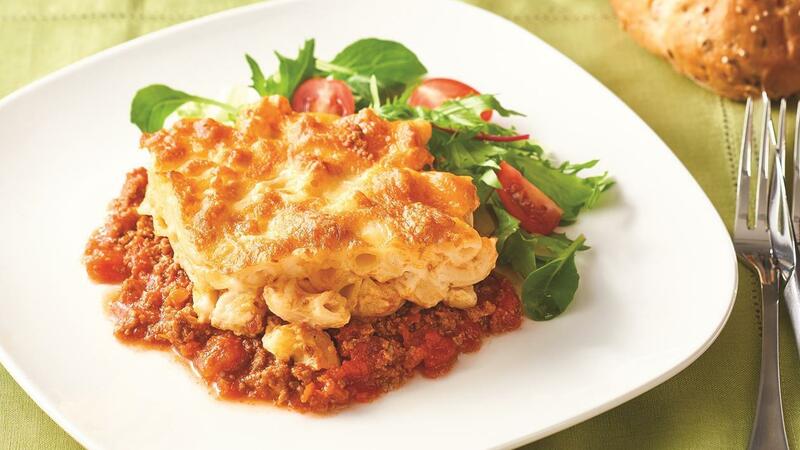 Pour a layer of beef mince into a large tray and add the macaroni cheese. Sprinkle over the additional 100g grated cheese. Put back in the oven and bake for 20 minutes at 160C until golden on top. Serve with a side salad and wholemeal roll.